Used BMW 1 Series Review - 2008-2013 Servicing, MPG, Insurance | What Car? 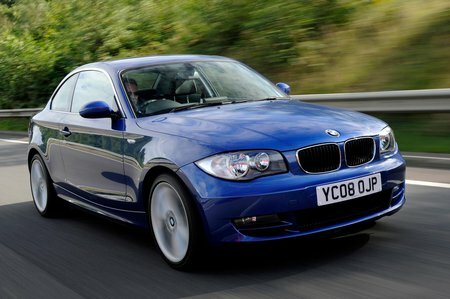 What used BMW 1 Series coupe will I get for my budget? How much does it cost to run a BMW 1 Series coupe? Like other models in BMW's range, the 1 Series uses engine stop-start technology to boost fuel economy. The 118d delivers an impressive average of 62.8mpg, and even the 120d does 60.1mpg. The 123d comes in at 55.4mpg. The petrol engines aren't that thirsty, either. The 120i does an average of 42.8mpg, while the 125i does 34.4mpg and the 135i 33.1mpg. Road tax costs are kept down, thanks to low CO2 emissions. The 118d is the cheapest producing just 119g/km of CO2, while the 120d comes in at 125g/km. The 1 Series Coupe's sporty nature means it is more expensive to insure than the 1 Series hatchback. The petrol models sit between insurance groups 26 and 34, but the diesels are slightly lower, between groups 23 and 32. Servicing costs are significantly higher than those of 1 Series hatchback, and more akin to those of the 3 Series Coupe ('05-).